The Fragile X Files: How much is too much? Ryan knows. How much is too much? Ryan knows. I am wondering lately whether we are doing too much. This is the boys' weekly schedule. Courage Center for speech and occupational therapy 3 days a week. Okay so it doesn't make an impressive bullet list. Only two things. But it leaves them very, very little time left for just hanging out. I haven't given them a lot of free time in the past because they didn't do constructive, educational, developmentally appropriate things with their free time. They didn't play, like other kids. If all they were going to do was yell and stim in front of the TV or computer for hours -- well, I wasn't going to give them a lot of time to do that. So I filled their schedules with beneficial things. The past couple of weeks though I find myself being relieved whenever we could cancel one of their appointments. And I think the boys feel the same way. Last night at Courage Center, while waiting his turn for occupational therapy, instead of playing his favorite games on the iPad, AJ climbed into my lap and put his head on my shoulder. His therapist reported that he wasn't terribly cooperative. He sat or stood in the corner a lot and didn't liven up until she said he could be all done, and go back out to his mom. And you remember how Zack was on Monday. He was very overstimulated when we left. I wonder if I should be giving them more time to themselves. My manny, Ryan Gosling, is thinking the same thing. 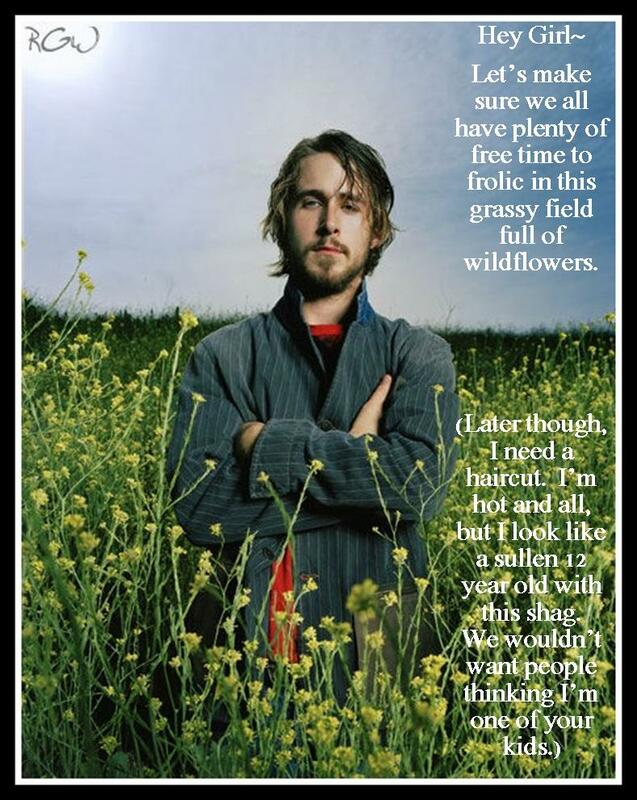 See the other Special Needs Ryan Gosling photos over here at Adventures in Extreme Parenthood, written by the girl with the most fun name ever, Sunday Stilwell. You can also find them by hunting for the Twitter hashtag #SNRyanGosling. And thanks to Ryan for being such a good sport. Not that there's anything he could do about this.